One of the biggest differences between KenKen puzzles and Sudoku puzzles is that the former are harder to represent compactly. Sudoku puzzles can be represented as a simple string of numbers, but the 2-dimensional cages of KenKen puzzles seem to require a more vebose representation. Fortunately, such a representation needn’t be complicated. To this end, we will store puzzles as text files, each line of which will state a “fact” about the puzzle. Lines will be comprised of whitespace-delimited symbols. A complete set of facts will unambiguously describe a puzzle. where “::size::” will be replaced by a number (e.g. 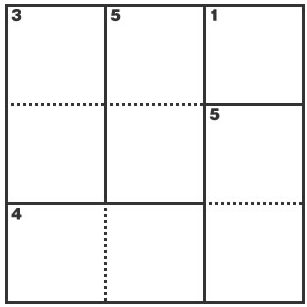 3, 6, or 9) representing the number of cells along one edge of the puzzle. This code will properly display complete or partial solutions stored as string->string dictionaries, in which the keys are cell IDs (of the same form used in puzzle definitions) and the values are made up of numbers from 1 to 9, representing the possible values of the cell. Next week (this weekend will likely cover other matters) we’ll combine the constraint classes we defined yesterday, the code presented today, and some simple propagation and search code to produce a complete solver for KenKen puzzles.